Two students from the Bangor University are busy getting ready for the launch of their long-term reminder app for mobile devices. Kalaivani, 32, and her husband Karthikesan, both from Singapore, are undergraduate students at the Bangor Business School and the College of Applied Science at Bangor University. They have been developing their own app, Key It In, over the last four months and are now gearing up to the launch on March 15th. 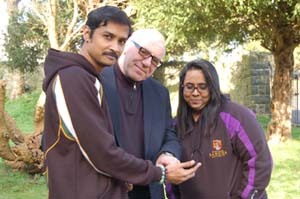 Karthikesan with mentor Chris Walker and KalaAbout the App, Kala said: “It is meant to address everybody in general. It is the concept of allowing people to store information about the location of valuable items which has been safely kept away. It eliminates the issue of having misplaced/forgotten the item after a prolonged period of time. It could be a TV manual guide you kept away for future reference or that valuable will and legal documents. “Having recently moved to Bangor, we had a lot of paper work that needed to be kept safe and we sometimes had difficulty remembering where we had kept them so we decided to develop an App that lets you note where you keep your important items. Kala’s husband, Karthik, already had prior knowledge and interest in the IT industry and studying in Bangor Universities School of Applied Science gave him an insight on how to go about programming and developing Apps. They now have their own company, Kastle, and hope to develop more apps in the future. Kala came to Bangor after completing two years of her degree programme at MDIS, in affiliation with Bangor University, in Singapore. Chris Walker, Enterprise Support Services Business Advisor, said: “'Working as Kala and Karthik's business advisor, has been an interesting and valuable experience. We started from the seeds of an idea, to develop an App that is unique and solves the problem of remembering where you've put things.It is particularly useful for providing one place for detailing where you have put precious items, like jewellery or important documents like a will, mortgage details, passports etc. Our process was to ensure that the App was financially viable and to develop a marketing plan and identify routes to market, target customers etc. It was also to source the coders and app developers, to build the App. B-Enterprising can help students and graduates who want to develop their business ideas through various HEFCW and Welsh Government funded initiatives such as one to one mentoring, specialist and interactive and practical workshops and events.